In the last week, our pool fence was built and I celebrated my birthday. Not too monumental for the average week … it was just an aluminum fence and a special date on the calendar that happens to be my birthday. Most of my birthdays have been great, and I spent this one with my husband and kids and we had a quiet dinner and a little dessert. It didn’t need to be a grand occasion this year, although I do enjoy a good party or a nice tandem parachute jump out of an airplane to celebrate. The hail storm hit long before dark on March 2nd and in some places near the house, it piled up almost 2 1/2 feet deep. Most of the hail was at least as big as baseballs, and some close to softball-size. I have NEVER seen, nor do I EVER want to see, hail that big again! We surveyed the damage – cars dinged up under the carport, holes in the vinyl siding, a broken glass pane, and quite a few plants and bushes that looked like they received a buzz cut. Eventually we would learn that our new roof took 70% damage as well. So, about that 3-ring circus… I was about to leave for a fabulous trip to Vegas to visit some high school friends when this all hit. I did take my trip – and spent my birthday hiking, skydiving, dining out at a fancy restaurant, and getting re-acquainted with my friends that I hadn’t seen in almost 30 years. I came home and the next day the roofers came with the insurance man and somewhere in there we took delivery and set-up of our new unpainted portable building. 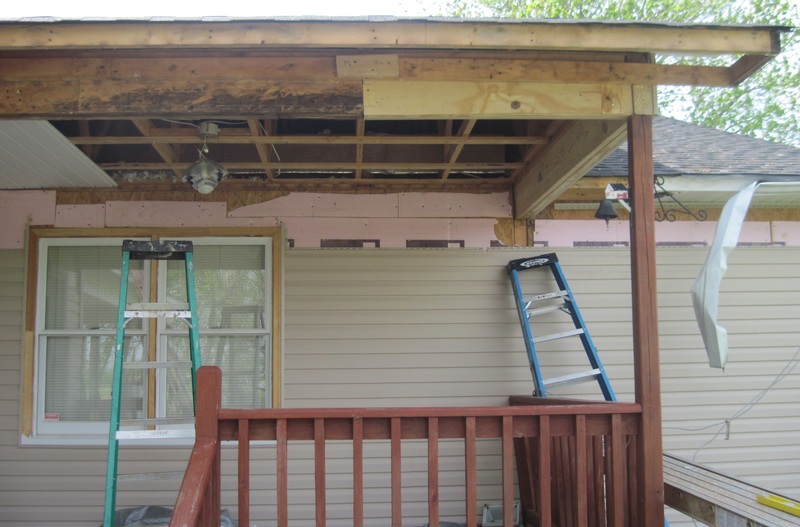 That week they re-did the roof, and another contracting team started ripping off all the siding and we were going to pay the extra money to have a the whole house done – so it would match! And I began spending the long days painting the new building and supervising the subcontractors. Did I mention the pneumonia that had manifested in me along with the flu that first week? Or the workers that were ONLY supervised by me and not their boss? Or the windows that had to be re-wrapped 4 times to get it right? Or how about the TERMITES that we found???? When most of this craziness was over, I had a spur-of-the-moment idea – “Let’s put in a pool!” Well, that went very well actually and I was very thankful for good workers because I was worn out. I can only imagine if a tornado had hit… I think I would have lost my mind! So, the pool fence is finished and I think there was a collective *sigh* between the house and the family. I’m going to put up a sign that says “No More Contractors!” I think I should put it on the bathroom mirror to remind myself not to ask for so much on my plate at once. It was quite a year, and looking back, I’m VERY GLAD IT’S OVER! There were many lessons learned, laughs to be had, and a few painful days where my anger grew way too large and my compassion grew Waaayyyy teeny tiny. We are ALL looking forward to using the pool this summer and getting the grass to grow. I think I’ll leave any ideas from Pinterest OFF my list of things to do though. This year, I want to enjoy all that work that was accomplished…. and see if I can regain just a LITTLE bit of my sanity. Next month I intend to take a short vacation to Arizona for some hiking and visiting of high school friends. That will probably help my family get THEIR sanity back!